Mountfield have been the UKs number one manufacturer of rotary mowers since the early 1960s. Mountfield mowers are designed and manufactured to ensure the gardening experience is a pleasure, to make cutting your lawn easier and to allow you to take pride in a job well done. The Mountfield S461RHP has a rear roller to leave that highly desirable classic striped effect to your lawn at an affordable price. 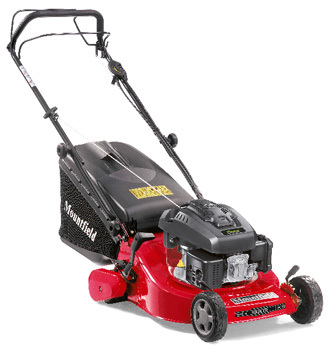 Powered by a Mountfield RM45 four stroke petrol engine, this mower is power driven. Grass cuttings are collected into a 55 litre capacity quality fabric collector. Cutting heights are adjustable from 20mm to 70mm. The robust cutting deck is constructed from steel. If you have a fine lawn and want those classic strips, look no further, the Mountfield S461RPD will give a superb finish. * Delivery of the Mountfield (Please enter model number) is included only to addresses in Norfolk and the Waveney Valley area of Suffolk. One of our own service engineers will deliver and install this machine. We provide full after sales support for all Mountfield products we sell from our branches at Horstead, Norwich and Toftwood, Dereham. Already own a Mountfield machine and need service or a spare part? Please contact us on 01603 738635 or 01362 699888.